The year is 5501, and mankind has spread among the stars. Or something to that extent. It's easier to summarize the bits of standard sci-fi lore that aren't included. To quote the game's official background page, "RimWorld does not include faster-than-light travel or true aliens." And there's probably mods for the aliens, if that's your thing. This is where it gets tricky. 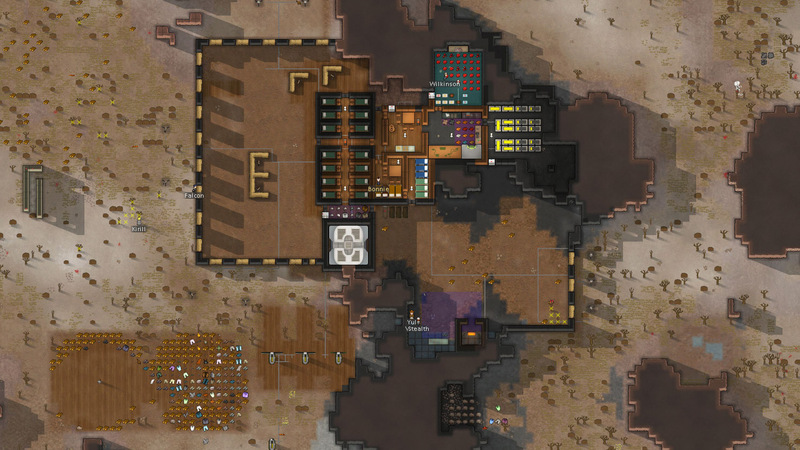 RimWorld is a science-fiction (in the vein of Firefly, or other similarly twangy settings) colony simulator. Think Oregon Trail meets Dwarf Fortress as written by Robert A. Heinlein in one of his darker moods with input from that one guy who won't shut up about Firefly, or maybe that one guy who won't shut up about Warhammer 40,000. It's designed by Ludeon Studios, which is essentially Tynan Sylvester, whose name might be familiar from some of the maps on Unreal Tournament 2004. Unfortunately, the top-down, roguelike nature of the game means that screenshots are horrifyingly boring to look at if you aren't great. Hell, even I'm bored by my screenshots. Which means that if you want to see what the game looks like, I'm not the best source. But hey, this is 2017, and you're reading this, so I'll make you a deal: I'll stop ranting about this soon if you promise to look into it a little once you're done reading. See, that's kinda hard to extract any real meaning from. Are those beds? Wind turbines? What are those weird tan things forming the letter E? To answer my own questions, yes, yes, and sandbags protecting automated turrets in case trouble gets past the walls. Trouble comes in myriad forms, from local tribes with bows and clubs, to raiders wielding machine guns and molotovs. Even Mother Nature will get her licks in, sending hordes of genetically modified beavers to decimate your tree supply, or deciding that those deer you've been hunting have had enough of your attacks. I've seen colonists go down from a few lucky hits by a squirrel attack. The cover system means that tactics and placement is important in all engagements, despite the seemingly rudimentary nature of the game. Rambo colonists will die, and not well. Things will explode, and catch fire. All your power will vanish from your batteries. This leads to all sorts of interesting bits of game design, such as why randomly generated characters can be so compelling (it's the same aspect of psychology that made Firewatch work so well), and it also leads to a sense of achievement when you aren't murdered in the first few weeks of landing by a combination of starvation, disease, and friendly fire. Or at least, it did for me. At $30 on Steam, it's prudent to wait for a sale unless these paragraphs have you salivating, but it's one of my favorite games, and I would be remiss in not recommending it. Good luck. You'll be wanting it.